Your ability to detect sensations or vibration may be diminished. Neuropathy allows injuries to remain unnoticed and untreated for lengthy periods of time. 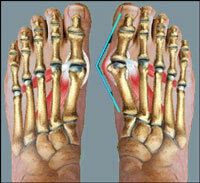 It may cause burning or sharp pains in feet and interfere with your sleep. Ironically, painful neuropathy may occur in combination with a loss of sensation. Neuropathy can also affect the nerves that supply the muscles in your feet and legs. This 'motor neuropathy' can cause muscle weakness or loss of tone in the thighs, legs, and feet, and the development of hammertoes, bunions, and other foot deformities. Treatment relies on early recognition of the ulceration by a podiatric surgeon, avoidance of weight bearing activities such as walking, avoidance of wearing "closed-in" shoes, and early intervention. Besides local wound care, dressings and antibiotics, other measures may be necessary to adequately relieve pressure on the area. When use of crutches, a wheelchair, or rest is not feasible, plaster casts, braces, healing sandals, or orthoses (special shoe inserts) can be used to protect the foot while it heals. If circulation is inadequate to allow healing, your podiatric surgeon may refer you to a vascular surgeon for appropriate evaluation and possible vascular reconstructive surgery. Shoes must always fit comfortably and have adequate width and depth for the toes. Leather shoes easily adapt to the shape of your feet and allow them to "breathe." Athletic shoes, jogging shoes and sneakers are usually excellent choices if they are well fitted and provide adequate cushioning. Your podiatric surgeon may recommend "extra depth" shoes, custom molded shoes to adapt to your particular needs, or orthoses to provide cushioning and support. Avoid temperature extremes - do not use hot water bottles or heating pads on your feet. Do not perform "bathroom surgery" on corns, calluses, or ingrown toenails.